Name Origin: Name for Robert François Martin (b. 1941), Professor of Geology at McGill University and long-time editor of The Canadian Mineralogist. Comments: Colorless, pseudohexagonal plate of martinite associated with sodalite and a clinoamphibole. (CanMin, v45:1281). Location: Poudrette quarry, Mont Saint-Hilaire, Quebec, Canada. 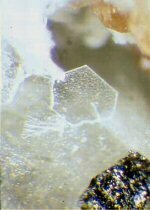 Scale: Crystal size 40 µm. Optical Data: Biaxial (-), a=1.529, b=1.549, g=1.551, bire=0.0220, 2V(Calc)=34, 2V(Meas)=38. Dispersion dispersion not observed. note: Specific Gravity of Martinite =2.54 gm/cc. U=PEMartinite x rElectron Density= 7.01 barns/cc.